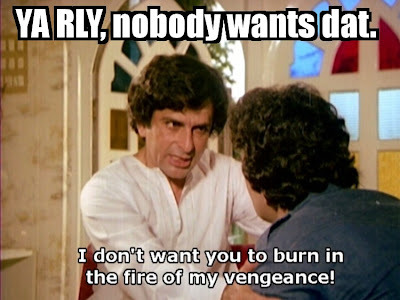 As promised: an LOLcat-inspired piece on this 1979 Kapoor/Kapoor masala-licious vehicle. It's not so much a discussion as it is an attempt to capture the essence and/or spirit of a fun but basically silly movie. Even if it you haven't seen it or don't know the precise story, I think you'll follow along if you remember that DMJM is full of money tensions, an evil guy, questions about revenge, and brotherly love. Lots of spoilerz ahead! Update to post (May 19, 2008): While link-hopping just now, I found the most amazing thing. 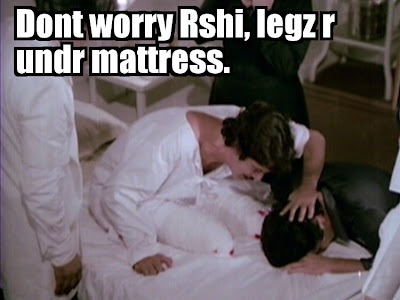 It seems that the LOLcat Bollywood article has already been done, on an Asian film site I've never encountered before tonight. Although not identical in form, it's only fair to point out that Steamed Prawn Buns/Kickin' Tikka Masala included a few LOL pictures in their pieces on Disco Dancer (imagine the possibilities! "fashion cat sayz: no black sockz w pink capes after Memorial Day") and Don (and maybe others as well - I haven't gone through the whole site). My hat is duly off. I think you've captured the essence of Duniya! Love the NAHIIIIN! 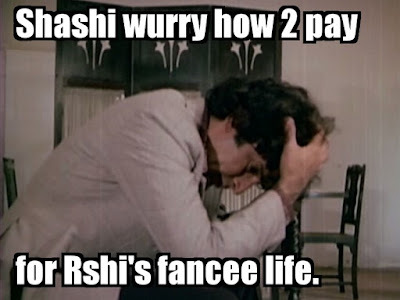 But OMG you capped the one moment in Tere Jaise Bhai, where Shashi gives Rishi the 'don't cry' look! 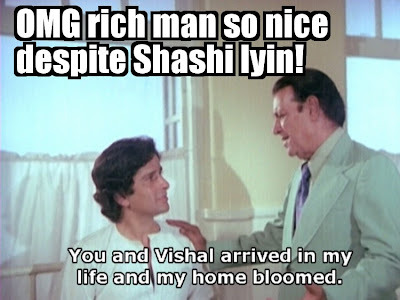 I always want to punch Shashi in the face when he does that! 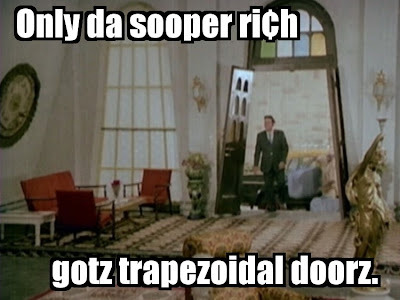 Trapezoidal doorz! Ha ha ha! 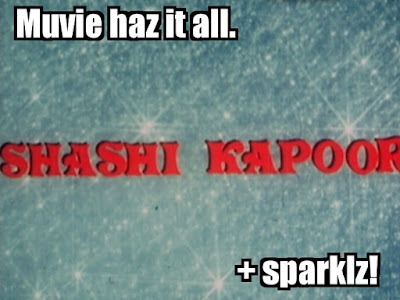 Well, I confess I was skeptical but you have pulled off the LOLbollywood review. I never understood the humor in traditional LOLcats but boy this is funny! I should have prefaced this whole project by admitting that despite an initial slight annoyance at demonstrating a disrespect for spelling for no good reason, I have grown to love a good LOLcat, partly because some of them have good plays with language and partly because some of the animal pictures are really cute, and my inner third-grader loves cute animal pictures. I have even tried to made some for the artifacts in the museum I work in (not for public consumption - just for fun) (for example, a colleague came up with "O $*#&^! Snakez got my legz!" for the sculptural group Lacocöon and His Sons). Also, please don't worry that this will be a regular feature. It will not. Maybe a scene here and there, but generally no. PPCC - Yay! And that song is many kinds of weird. 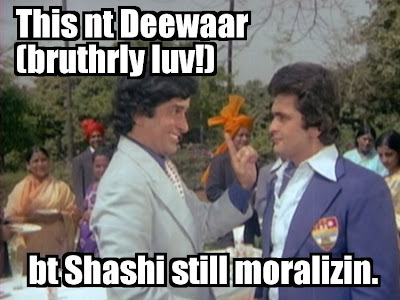 Shashi looks so uncomfortable in it (reasonable, but unsettling). Anarchivist - I love those doors! I hadn't noticed the walls and windows slanted until I saw the open doors, and then I spent a lot of energy looking at the set of that house. It is fab! I have a screencap of Shashi lounging on a truly fabulous sofa, and there are closet doors that look like a huge tapestry. Beth, you've reduced the whole movie to 19 pictures and this is a lot more fun than the movie itself! 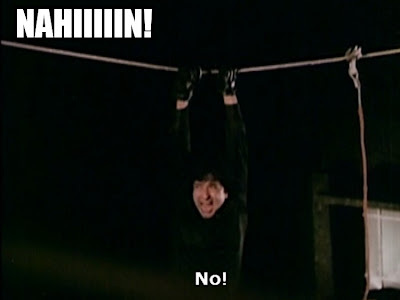 :) Now, unless someone wants to see the trapeze stunts, there is no need to watch the movie at all!! Bollyviewer - Hurrah! 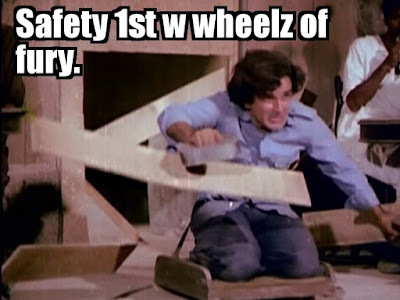 :) It really isn't all that awesome of a movie, frankly. It's fine, but its masala mix is too slanted towards violence and revenge for my taste - and Rishi gets most of the romance and comedy, booo. 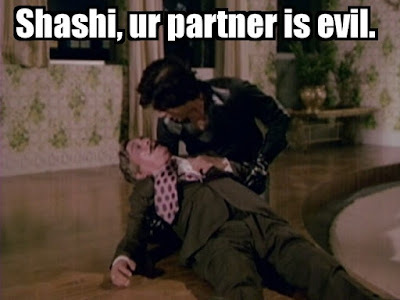 I think Shashi's first scene with Mrs. Robins is my favorite in the whole movie. 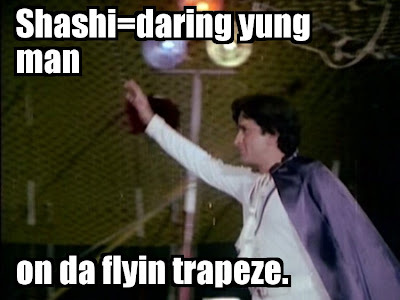 As for the trapeze stunts, I hemmed and hawed over whether to include a picture of them. I couldn't get a screen cap that really showed why they were cool, but the routine they do with hoods over their eyes really is scary to me. My stomach lurched while watching. Kirsten - Thanky! :) I'm glad you liked (and thanks for stopping by)! Shweta - Heehee! 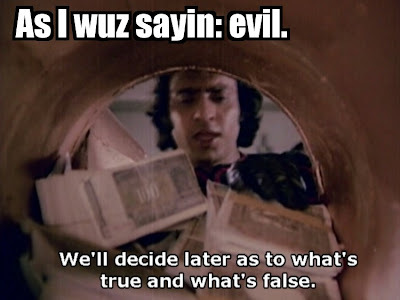 The day YRF lets me work for them...well, look out, that's all I have to say. I'm digging this new avatar of BLB. 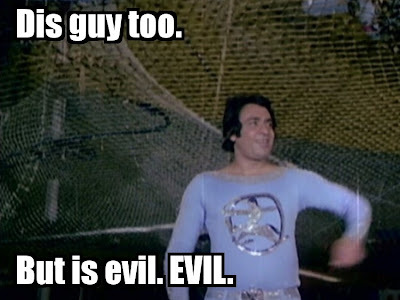 Loved the Ranjeet sequences. 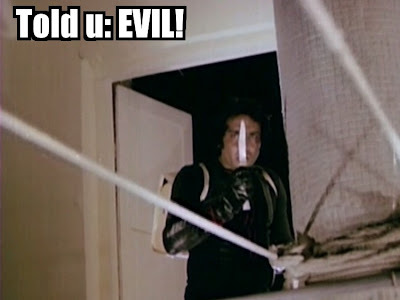 I can only imagine what Beth could do with a movie starring Shakti Kapoor. Hee! There is much LOLing to be done if one is so inclined. The sad thing is that I had so much fun with this one that I had to try really hard not to do it with The Householder. It would work really well with any good masala romp! 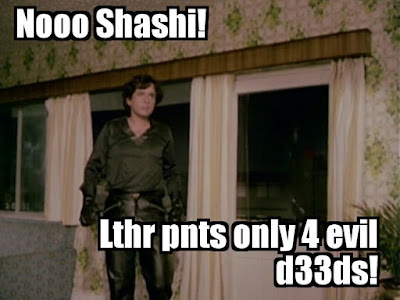 I *hate* LOLcats but LOLBolly is my new favorite thanks to your post. Tee hee! 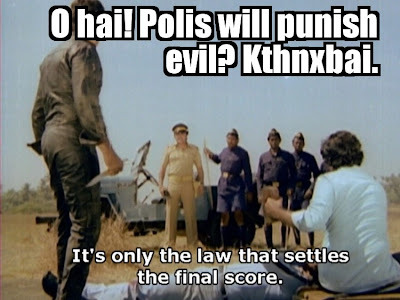 LOLBolly is very, very tempting. Sometimes the visuals just scream for it. Just found your blog, by the way!